The Advance Estimate of 2nd Quarter GDP from the Bureau of Economic Analysis released on Friday included an annual revision to the past 3 years of GDP releases, revising previously published data from the first quarter of 2014 through the first quarter of 2017, which on net indicated that US economic growth over the period from 2014 to 2016 was at a 2.3% annual rate, revised from the 2.2% composite annual growth previously published for that period of the current expansion. In addition to the recent quarters of 2017, this report also showed that the GDP growth rate for 2014 was revised from 2.4% to 2.6%; that the growth rate for 2015 was revised from 2.6% to 2.9%, and that the GDP growth rate for 2016 was revised from 1.6% to 1.5%. All of those revisions should leave you with the sense to take this initial advance estimate of 2nd quarter growth, which was released on Friday with some June data still not reported, with a grain of salt. The Advance Estimate of 2nd Quarter GDP indicated that the real output of goods and services produced in the US grew at a 2.6% annual rate over the output of the 1st quarter of this year, which we have just seen was revised to show growth at a 1.2% rate. The BEA cautions that the source data is incomplete and also subject to revisions, which have now averaged +/-0.6% in either direction from the advance to the third estimate, and +/- 1.2% from the advance estimate to the final reading. Note that June construction and inventory data have yet to be reported, and that information on the assumptions used for those reports and unavailable source data for this advance estimate is provided in a technical note that is posted with the news release, and references an Excel file with key source data and assumptions. While we cover the details on the 2nd quarter below, remember that the GDP release reports all quarter over quarter percentage changes at an annual rate, which means that they're expressed as a change a bit over 4 times of that what actually occurred over the 3 month period, and that the prefix "real" is used to indicate that each change has been adjusted for inflation using price changes chained from 2009, and then that all percentage changes in this report are calculated from those 2009 dollar figures, which would be better thought of as a quantity indexes than as any reality based dollar amounts. For our purposes, all the data that we'll use in reporting the changes here comes directly from the pdf for the 1st estimate of 2nd quarter GDP, which is linked to on the sidebar of the BEA press release, which also offer links to just the tables on Excel and other technical notes. Specifically, we refer to table 1, which shows the real percentage change in each of the GDP components annually and quarterly since 2013, table 2, which shows the contribution of each of the components to the GDP figures for those quarters and years, table 3a, which shows the current dollar value of each of the GDP components, table 3b, which shows the inflation adjusted value of each of those components, table 4, which shows the change in the price indexes for each of the components; and to table 5, which shows the quantity indexes for each of the components, which are used to convert current dollar figures into units of output represented by chained dollar amounts....the intervening tables in this release (ie, 1a, 1b, 2a, 2b,etc) give us the previously published data for each of those metrics going back to the 3rd quarter of 2013, should anyone be interested in the finer details of the annual revision..
Just as personal consumption expenditures are adjusted for inflation using the PCE price indices to arrive at real PCE, the other current dollar components of GDP are also adjusted for inflation with the quantity indexes shown in table 5 of the GDP pdf to yield the real change in the output of goods or services. Hence, real gross private domestic investment, which had risen at a 8.2% annual rate in the 1st quarter as investment in residential and non-residential structures soared, rose at a 2.2% annual rate in the 2nd quarter, as investment in residential property fell. Real non residential fixed investment rose at a 5.2% annual rate as real investment in non-residential structures rose at a 4.9% rate, real investment in equipment rose at a 8.2% rate, and investment in intellectual property grew at 1.4% rate. As a result, investment in real non residential fixed investment added 0.62 percentage points to the change in 2nd quarter GDP as real investment in non-residential structures added 0.14 percentage points, real investment in equipment added 0.44 percentage points to the change in GDP, and investment in intellectual property added 0.06 percentage points to the change in GDP. However, residential investment fell at a 6.8% rate and hence subtracted 0.27 percentage points from the 2nd quarter's GDP, leaving the total fixed investment contribution at 0.36 percentage points. For an easy to read table as to what's included in each of those investment categories, see the NIPA Handbook, Chapter 6, page 3. Meanwhile, in the first real drop since the 3rd quarter of 2011, investment in real private inventories fell by an inflation adjusted $0.3 billion in the 2nd quarter, after they had grown by an adjusted $1.2 billion in the 1st quarter, and as a result the $1.5 billion downward swing in inventory growth subtracted 0.02 percentage points from the 2nd quarter's growth rate, after an inflation adjusted $61.9 billion decrease in inventory growth in the 1st quarter had subtracted 1.46 percentage points from that quarter's GDP growth. However, smaller inventories indicate that less of the goods produced during the quarter were being left "sitting on the shelf”, so their quarter over quarter decrease by $1.5 billion meant that real final sales of GDP were relatively greater by that much, which was still not enough to significantly boost real final sales of GDP, which increased at a 2.6% rate in the 2nd quarter. That's compared to the real final sales growth at a 2.7% rate in 1st quarter, when the change in the decrease in inventory growth was much greater..
After adjustment for higher export and import prices, both real exports and real imports increased in the 2nd quarter, as our real exports of goods and services rose at a 4.1% rate in the second quarter, after rising at a 7.3% rate in the 1st quarter, while our real imports rose at a 2.1% rate in the 2nd quarter after rising at a 4.3% rate in the 1st quarter. As you'll recall, increases in exports are added to GDP because they are part of our production that was not consumed or added to investment in our country (& hence not counted in GDP elsewhere), while increases in imports subtract from GDP because they represent either consumption or investment that was added to another GDP component that shouldn't have been because it was not produced here. Thus the 2nd quarter increase in real exports added 0.48 percentage points to 2nd quarter GDP, after adding 0.85 percentage points to first quarter GDP. On the other hand, since imports subtract from GDP, their increase at a 2.1% rate subtracted 0.31 percentage points from 2nd quarter GDP, after first quarter imports had subtracted 0.63 percentage points from that quarter's growth. As a result, our improving trade balance added a total of 0.18 percentage points to 2nd quarter GDP, after a revised improved trade deficit added 0.22 percentage points in the first quarter..
Our FRED bar graph below has been updated to include 2nd quarter GDP as well as the revisions to each of the GDP components from prior years resulting from this week's annual revision. Each color coded bar below shows the real change, in billions of chained 2009 dollars, in one of the major components of GDP over each quarter since the beginning of 2013. In each quarterly grouping of seven bars on this graph, the quarterly changes in real (ie, inflation adjusted) personal consumption expenditures are shown in blue, the changes in real gross private investment, including structures, equipment and intangibles, are shown in red, the quarterly change in private inventories is shown in yellow, the real change in imports are shown in green, the real change in exports are shown in purple, while the real change in state and local government spending and investment is shown in pink, and the real change in Federal government spending and investment is shown in grey. Those components of GDP that contracted in a given quarter are shown below the zero line and subtract from GDP, those that grew during that quarter are above the line and added to GDP. The exception to that is imports in green, which subtract from GDP, and which are shown on this chart as a negative, so that when imports shrink, as they did in the recent quarter, they will appear above the line as an addition to GDP, and when they increase, they'll appear below the zero line. 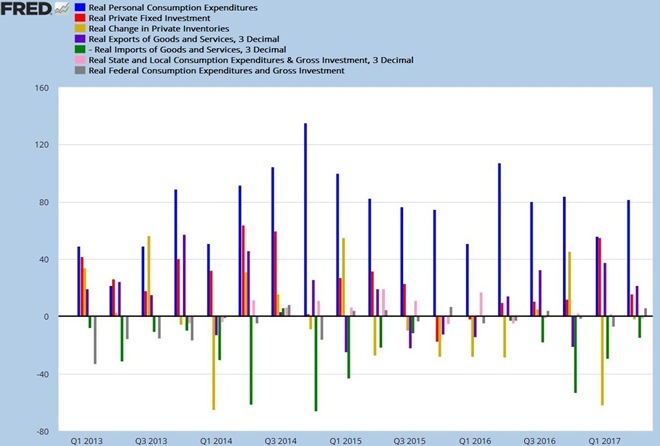 It's fairly clear that our personal consumption expenditures has underpinned GDP growth over this period, while increasing imports, and more recently falling inventory investment, have been the major negatives. In the 2nd quarter, on the far right, we see that the major reason for the respectable growth in the 2nd quarter was that there were no major negatives except for the increase in imports, which itself was offset by the increase in exports. Generally, we’d note that the quarters with the poorest GDP growth are those where one or more of the major GDP components substantially contracts, subtracting from the growth added by the others. I'm having a hard time justifying such "great" unemployment rates with such pathetic 2016 annual growth. But it seems everything is broken these days, including economic statistics. Thanks for this thorough overview.